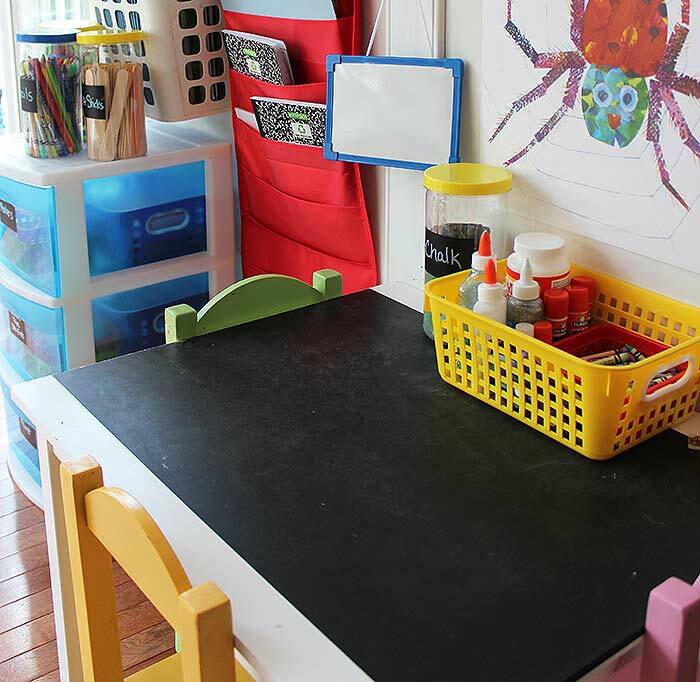 Organize kids art supplies in a small space with these clever and inexpensive ideas. 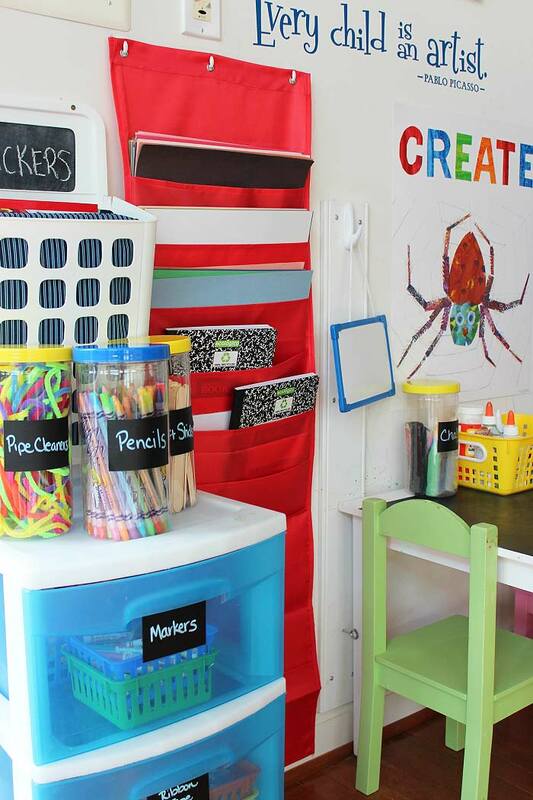 Back to School is the perfect time to figure out how to organize your kids art supplies. I love stocking up on everything we use because you can find great deals on arts and craft supplies this time of year. But my kids craft area is pretty small, so I need to get creative to make sure all those art supplies are organized and accessible. I just finished organizing our craft space and I love how it turned out. Want a tour? 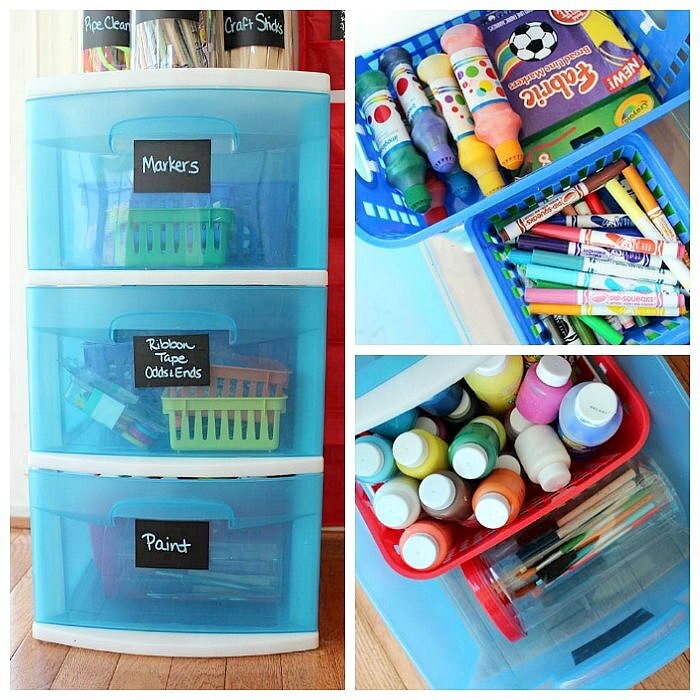 Let me show you around and help you organize your kids art supplies too! I received some of the items featured in this post for free from Oriental Trading Company in exchange for my honest review. This post contains affiliate links. See my Disclosure Policy for details. My kids craft area is not large. Though I am hoping to convert a spare bedroom into a craft room soon, right now we use a little under 5 feet of wall space in between our kitchen and playroom (see how I organized our playroom here). Even though it's small, it is a bright, welcoming, happy space that encourages my boys to create and craft. 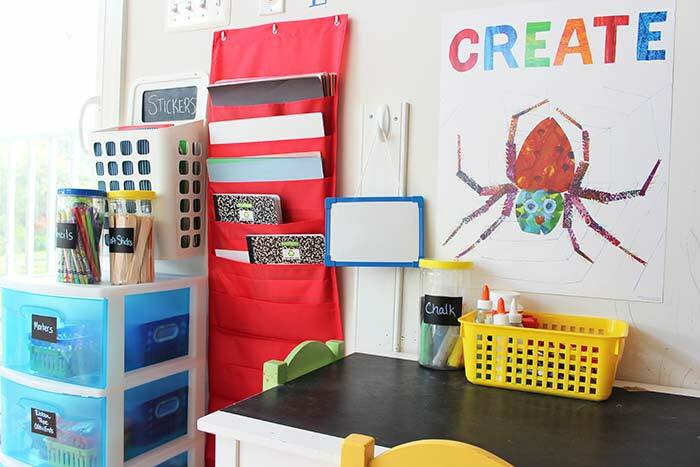 With a little organization I can fit everything that we need comfortably in the space, without it looking cluttered and with all our art supplies easily accessible. Here's how. I store the majority of our art supplies in a plastic 3 drawer unit. I've had this forever and have just repurposed it to our craft room. You can find something similar here. I went through all our supplies and sorted them into categories. 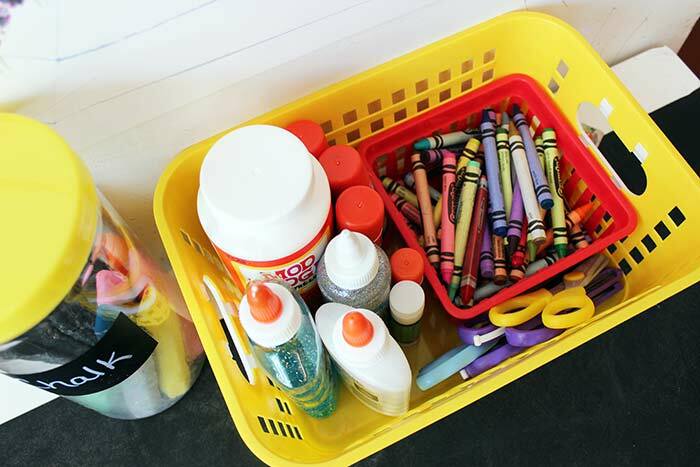 I put our markers on top, with the larger ones and dot markers in Tall Organizing Baskets. These are awesome because they have sturdy handles so I can pull them out and easily carry them to the craft table. I store our small markers in these Small Square Storage Baskets. 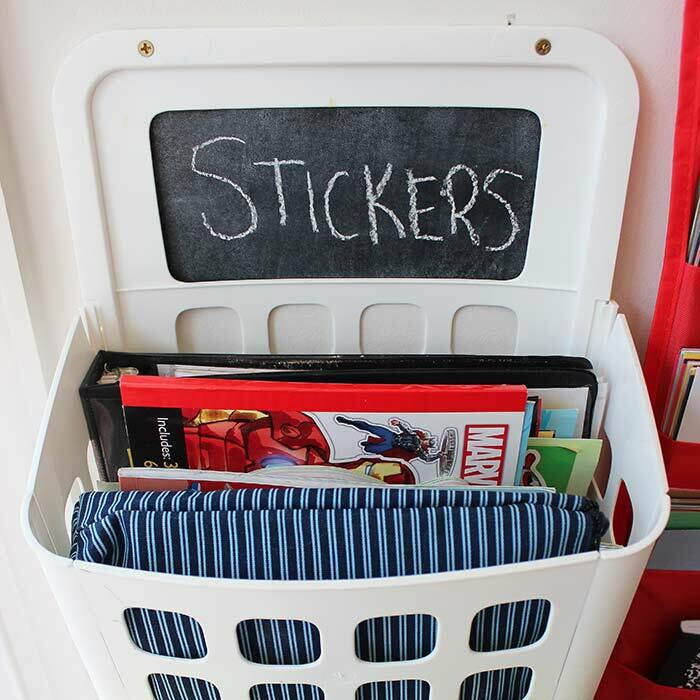 I love these because they stack, so I can create a small basket of markers for each of my boys and still keep them in one spot. I used the same baskets in the other two drawers - in the center I organized our ribbons and tape, along with other craft odds and ends - googly eyes, buttons, etc. In the bottom drawer I stored our paint in another tall basket and put all our brushes in one of these Colorful Storage Canisters. I used chalkboard labels and chalk markers to label each drawer so we know where everything goes. 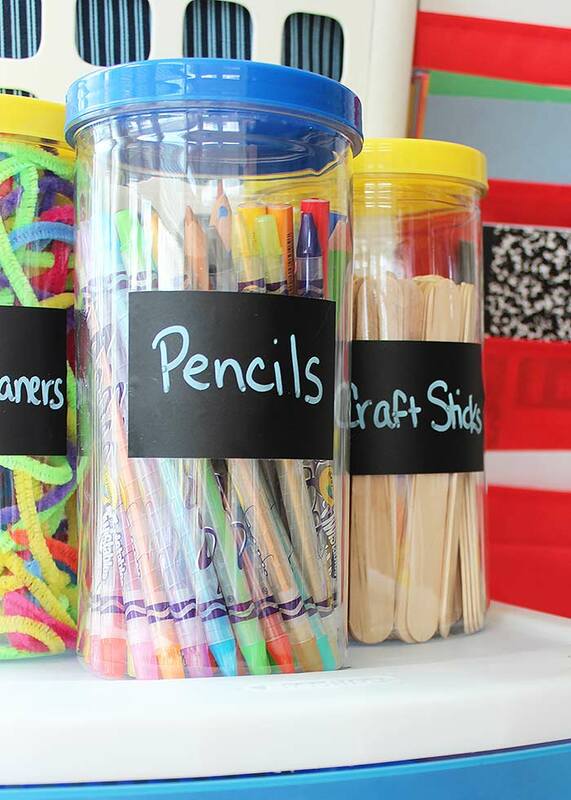 I used 3 more storage canisters for the top of the drawer unit - one for pencils, one for craft sticks, and one for pipe cleaners - and labeled each of these as well. One of my best tricks for organizing a small space is utilizing vertical storage. This keeps your floor and table tops clean and gives you lots more storage space. For my kids craft area, I used two clever ideas to create vertical storage. I picked up a hanging trash can from IKEA for $4 and use it as a basket for my boys' stickers and sticker books. I added a square of chalkboard contact paper as a label. Then I used this awesome hanging file folder pocket chart to store all our paper and notebooks for doodling. 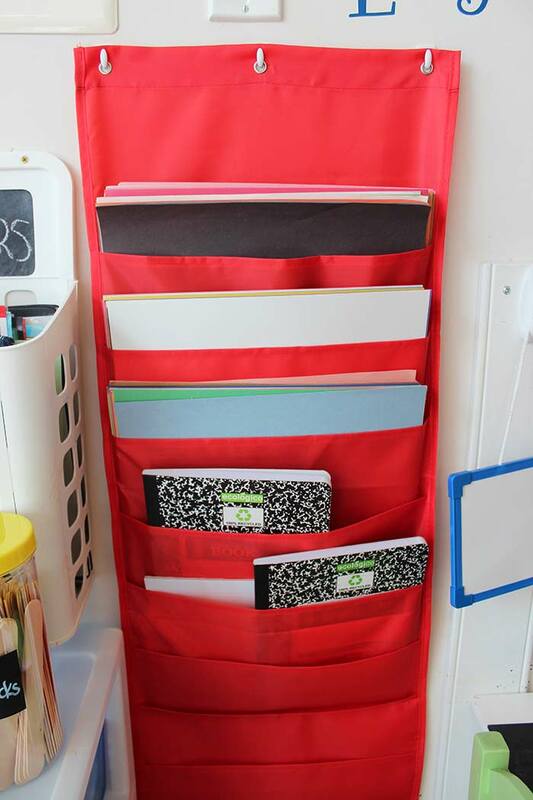 I LOVE how much storage there is in this wall organizer - it has 10 really roomy pockets that fit all our paper and more! I actually left the bottom few pockets empty and they will make a great place to store our finished art projects or masterpieces in the making. I hung this easily on the wall with these Command hooks. We have a small table and chairs in our craft area so the boys have a place to create. Ours was a gift, but this one is very similar. I turned it into a chalk table by adding a sheet of chalkboard contact paper down the center. This was a super easy hack that took just minutes to do and over two years later it is still in perfect condition. I added another storage canister to the table for chalk and an eraser, and a tall storage basket for scissors and glue. I put a small square basket inside for crayons. When you're working with a small space, you want to have as little on the surfaces as possible. I chose only our most used supplies to keep out on the table and limited it to just one basket and one canister so that we still have lots of room to work. 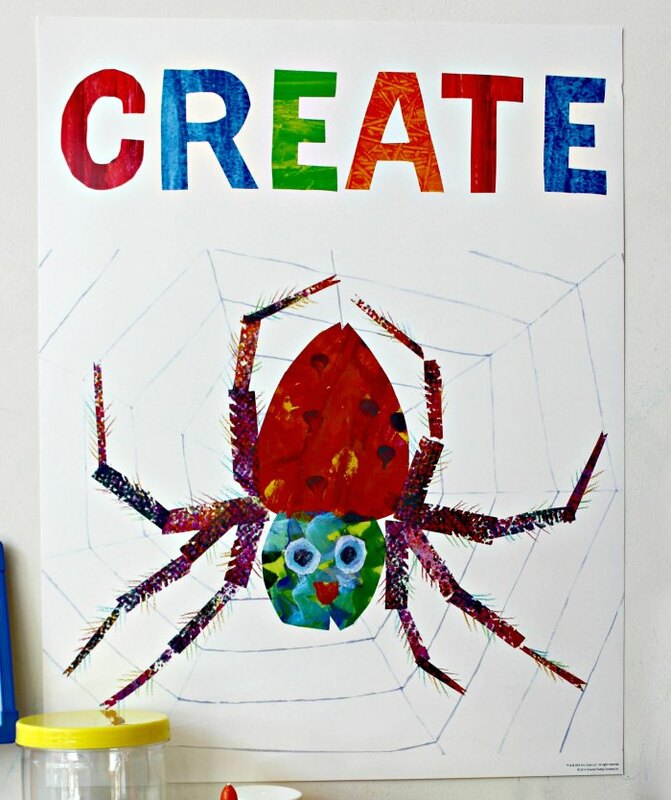 I also added this fabulous "Create" poster inspired by The World of Eric Carle™. He is one of our absolute favorites and I just LOVE having this in our craft area. It's actually part of a six poster set, and though we only had room for one in this small space I'll be using the rest of the set in another part of the house. I couldn't be happier with how our space turned out - everything has a place to go, is labeled, and easy to access and use. My boys are so excited to do crafts and with preschool starting in just a couple of weeks, they now have a fun space to work on things that they have learned and to store their projects. We love it! 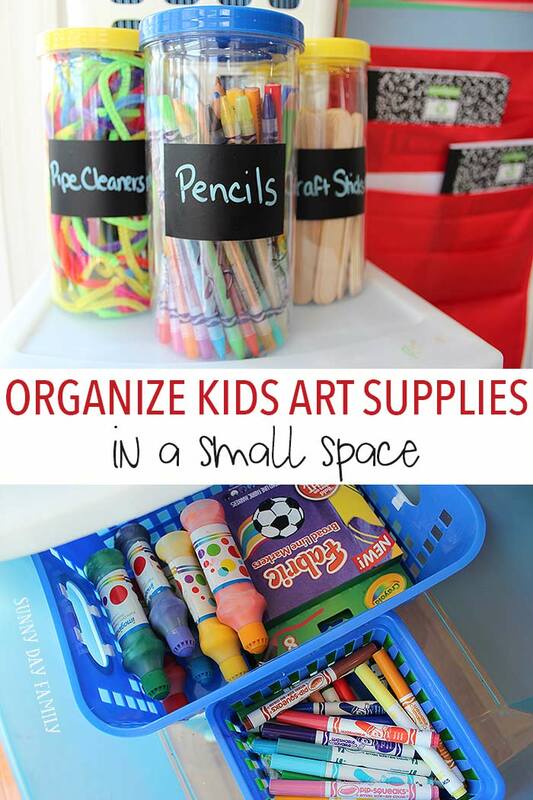 Our craft area wouldn't be complete without these kids art supply essentials! Want to learn even more ways to organize your life with kids? Check out my ultimate guide to organizing for moms - with ideas for everything from cleaning to meal planning, kids organizing, printable planners and more. See it here. I LOVE those canisters - I need to get those!